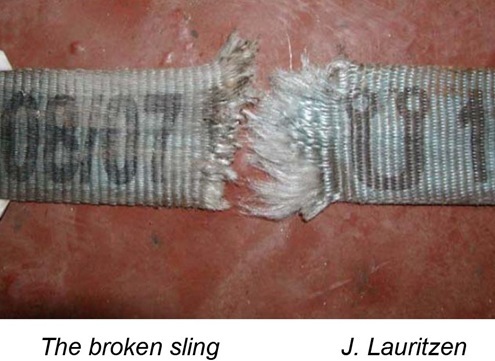 Poly Propylene Sling if used wrongly can cause accidents.Unfortunately we come to know that sling was used wrongly only after the accident. Here is an accident involving Chief Officer of Knud Lauritzen, Refrigerated Cargo Ship who broke his right thigh bone, right under arm and injured his right hand. However immediate medical treatment was provided to him. Division for Investigation of Maritime Accidents of Danish Maritime Authority has released Marine Accident Report on April 24. Knud Lauritzen, Refrigerated Cargo Ship was at Port Hueneme, California. Faulty crane no 5 was to be secured for sea. Chief Engineer and Chief Officer were carrying out the operation on February 04. 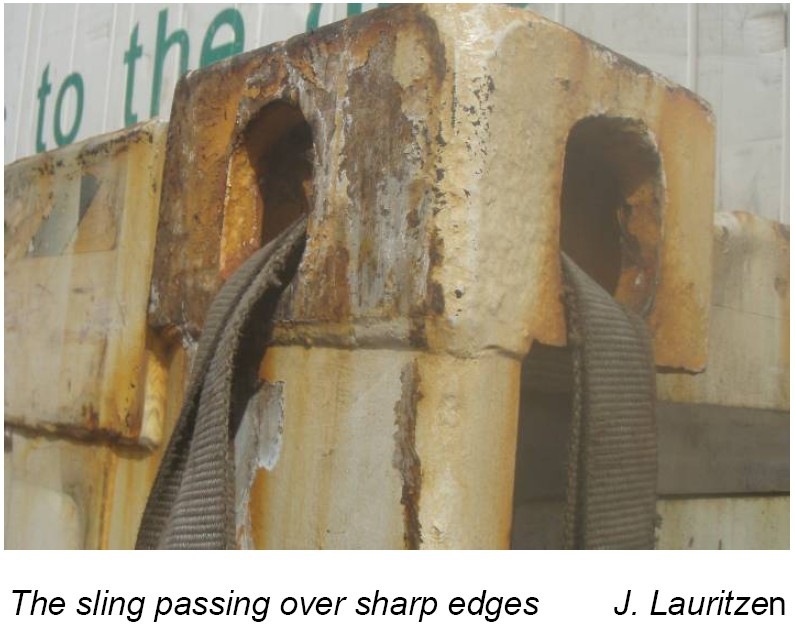 During the securing operation, the poly propylene sling passing through the sharp edges in the container corner used for lifting the container was cut in two pieces due to friction. The cargo hook and block weighing 460 kg fell on the Chief Officer’s right leg. The accident took place around 0155 hours local time. When the accident took place, 32 year old Chief Officer was wearing helmet, safety shoes, gloves and boiler suit. all fastening in container corners or similar positions must be done by using shackles,wires or chains. 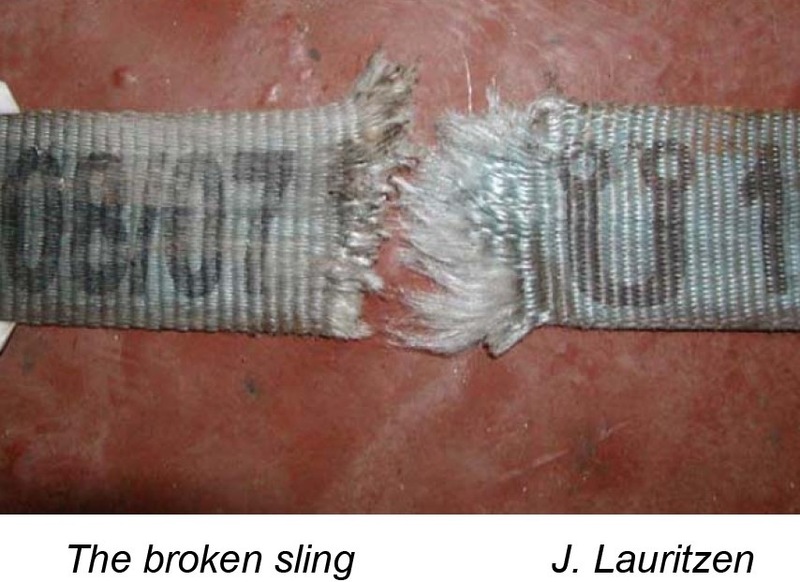 avoid passing of ropes,slings and wires through edges or around corners where chafing is possible. avoid going near or standing below hanging items. Here are some photographs from the accident report. 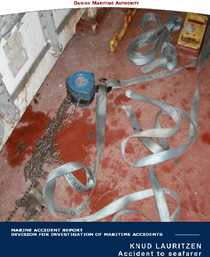 Read the full Marine Accident Report as pdf.